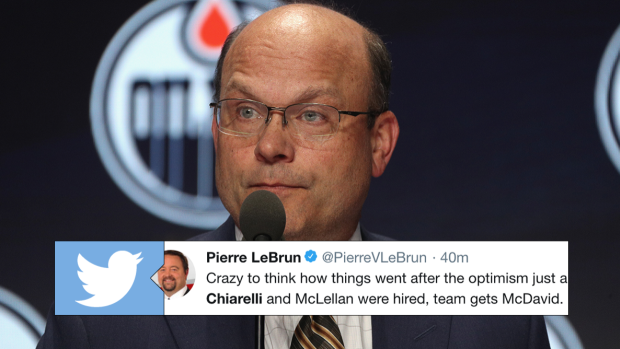 If you're just waking up, you'll probably be shocked to learn that the Edmonton Oilers fired Peter Chiarelli while most of the sports world was asleep. There's no way to tiptoe around the fact that Oilers fans wanted Chiarelli out, but the move was shocking because of the fact that he just signed Mikko Koskinen to an extension. Tuesday's loss to the basement-dwelling Red Wings was apparently the last straw, though, and the hockey world had a number of different reactions to the news. My mind is still blown that the #Oilers allowed Peter Chiarelli to register a contract for Mikko Koskinen - at an AAV higher than his top defenceman in Oscar Klefbom, not an insignificant deal - a mere 30 hours before firing him. I sincerely hope he lands on his feet as GM of another team. Geez, three and a half seasons and two firings. Too late. Chiarelli has already committed the Oilers to paying Mikko Koskinen $13.5M. I'm not excited about Chiarelli being fired. Team us minimum 2 years from competing and only because of McDavid. The whole front office needs to go. If you could eliminate one of Chiarelli's moves as GM which one would it be? I'm going Reinhart trade...What Say You? In the big picture for the Oilers, here's the important thing: they have McDavid, Draisaitl, Klefbom and RNH. Chiarelli replaced every regular other than those four when he took over. Expect similar change with the next GM. The Oilers are very fixable. The next GM is obviously going to want to start fresh, man I feel bad for McDavid. Feel bad for Pete. Good guy. Stanley Cup champion GM so knows what he's doing despite the haters. Brought EDM back to POs. Yes EDM took big step back last yr but gave Todd another chance & when that didn't work out, hired Hitch & team is now only 3 points out of Wild Card spot. It remains to be seen who will take over for Chiarelli, but it's something the entire hockey world is keeping an eye on.